And the roller coaster ride continues for Tiger Woods. Less than a week after the 14-time major winner won his third tour event of the season, more than any other player in the sport, at AT&T National with a near-flawless final 36 holes, he came crashing back down to earth at the Greenbrier Classic. For the third time in his career, Woods followed up a win with a missed cut, after he posted a 1-under 69 on Friday to fall one shot short of making the weekend. The missed cut was only the ninth of his career, but the third in the last 11 months. 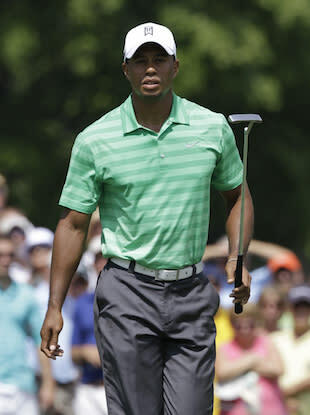 Blame it on being unfamiliar with the setup at The Old White TPC, but Woods looked lost for 36 holes. Despite hitting almost 80 percent of his fairways on Friday, he struggled with his short irons and couldn't get anything going with the putter, finishing the week with an average of almost 30 putts per round. With the Greenbrier Classic now in Woods' rearview, he has less than two weeks to prepare for the Open Championship. The good news for Woods is that the last time he missed two cuts in a season back in 2005, he went on to win the Open Championship at the Old Course. That doesn't necessarily mean Woods is going to do the same thing this year, especially if he brings his Greenbrier game to Royal Lytham and St Annes. There's no question this year has been a long, strange trip for Tiger Woods, who failed to post at least a top-20 finish following a win for the third time this year. Just when it felt like we could stop questioning Woods' game, he gives us a reason to take a step back and wonder how the magic from Congressional disappeared so quickly. Conventional wisdom would tell us that we should be a little concerned, but considering how inconsistent Woods has been this year, seeing an MC next to his name doesn't seem like that big of a deal. For the moment, all we can do is wait for the Open Championship and see which Tiger shows up.